This quick-change earring finding tutorial is for people who prefer post-style earrings as opposed to the usual french wire. After all, not everyone can easily wear the french wire style. 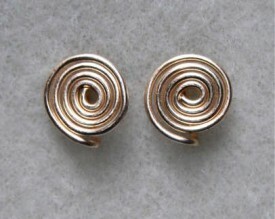 Not to mention that there are times when a post earring is more practical, like with the heavier earring styles. At any rate, I see very few video tutorials that show how to make post earring findings. So not only will I do that for you, but I will also show you how to make them in a quick-change style! This will let you quickly (in just a few seconds) change out the earrings you wear. NOTE: After I published this post, I got some messages that something very similar had appeared in the Step-by-Step Wire magazine. Since I don’t read it (although perhaps I should), I didn’t realize someone else had made post-style. Mine are slightly different at least! Here are the supplies and tools that you will need to make these earrings. Wire, 20 gauge. Two pieces, each about 3 inches long. Half-hard is best, but you can use dead soft if needed. Note: You can use 21 gauge wire, but if you do, I recommend that it be full-hard. Earnuts, two. I use small rubber earnuts in the tutorial, but you can also use larger rubber or plastic if preferred. You can also try regular metal earnuts, but they may or may not fit 20 gauge wire. Metal file (for smoothing the ends of the post). The video is about 12 minutes long, and once you’ve done it a time or two, you will be able to make a pair of these quick-change post earrings in just a few minutes. Sit back and enjoy! And if you have enjoyed this video, I’d appreciate you “liking” me on Facebook (thanks!). What a great idea! Thank you for sharing it with us! I always have customers who have ear holes that are big from being stretched or torn and would prefer posts to cover them up. This is perfect. Thanks again! 🙂 Thank you for such a great idea. I can’t wait to try this!! mastered the sliding knot because of your great instructions, which i have been fighting with for over a year! I so appreciate the time you take to share these videos with us. I will be following you on YouTube….Thanks so much again!